Sunday was my last day with these girls! They were my 10th grade Sunday School class. (and I had them in 9th grade too!) They are moving up to 11th grade, and I got bumped up to 12th grade! My teaching partner, Sabrina, is on the top left. It was our first year to teach together and it worked out great. We are total opposites. She's super smart, went to seminary AND law school, and knows lots of languages. I am none of those things! I know English and some pig latin. Anyway, we balanced each other out great. Or maybe she just balanced me! So Sabrina and I will be teaching the seniors together. I'm excited about getting those girls ready to go off to college. I am the girl that can tell them what NOT to do. Hello, academic probation my first semester! I was sincerely shocked to learn that I actually had to study. My social life was my first priority. It was a fun 4 years at Texas Tech! Katie will promote to her new class this Sunday too. Katie mainly wants her mommy and a select few other people! I'm praying she bonds quickly! This picture has nothing to do with that, but I like it. 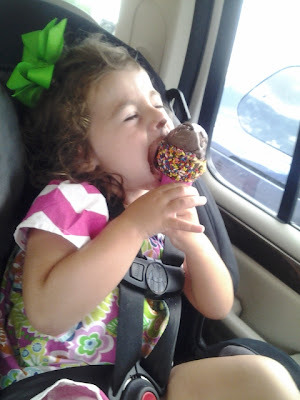 Katie was mostly concerned about eating all the sprinkles off her cone. She got lots of ice cream up her nose! I still have some necklaces left if you want one! I will have them available until Friday, then they are going up to Golightlys. I love that your going to be with my girls next year, it makes letting them go a little easier that you'll be with them! Congrats on becoming a Senior! ;) I responded to your email, but I haven't heard back from you. Just wanted to check with you. Your girls will be blessed to have you and Sabrina. What a great combo and I'm sure Katie will do fine with her new teacher as she's so easy to love but I know she'll miss Mrs. Katie as my Ireland did too.